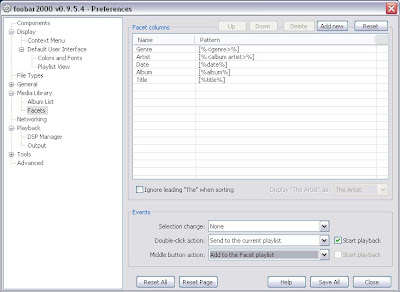 Go to Menu>File>Preferences, then go to the section "Media Library"
- Enable "Cursor follows playback"
- Disable "Playback follows cursor"
Click on the button "Add New" on top, then enter "Title" in the first column and "[%title%]" in the second cell. 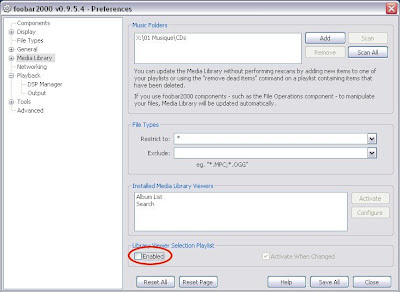 Comment: The Facet Playlist will replace Winamp's "playlist editor"
You can download a ready-made setup, but it is better to make your own at your taste to understand everything. 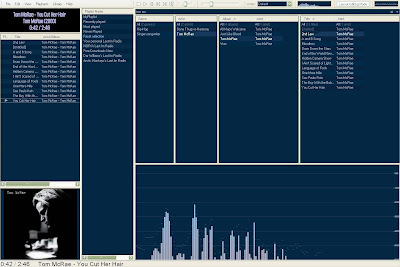 I will describe how to make something that looks a bit like winamp. A UI element is an element located in a frame. Replace the two elements on the top-right by the facets by right-clicking on the vertical separator, and chosing "Replace UI Element...". Then, in the "Media Library Viewers", chose "Facets"
- 3rd facet: "Multiple columns" then "Album", then "Artist"
- 4th facet: "Multiple columns" then "Title", then "Artist"
You're done! Now put any text in the search bar above the facets, and their content updates in real-time. -Remove the big element on the bottom-right by right clicking on a tab and "cut UI Element"
-Replace the element on the left by a "Split Left-Right"
-By right-clicking in its area, replace the element on the extreme left by a "Splitter (Top/Bottom)"
-Replace the left-top element by "Selection information / Selection Properties"
-Insert the vertical area in the middle by "Utility / Playlist manager"
You can play with the sizes and the split, tabs, and different elements such as equalizer, vizualisations... and do anything you want. Tip: If you have split an area and want to unsplit it, right-click on the separator and replace it with an element. Finally, in the Playlist Manager (the vertical area in the middle), double-click on "Facet selection" to display the current playlist in the Playlist View on the left. Regarding the display of now playing information (at the top-left corner), see that post. 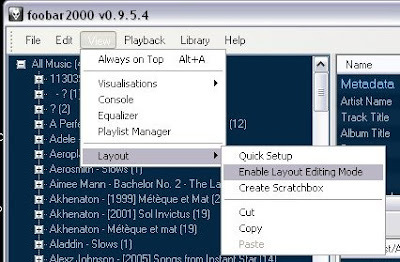 Hi, I was following your guide to make foobar like winamp, but I noticed the Layout menu has different options (Live editing and Default) than the ones shown in one of your pictures. I suppose these were changed in the latest version. Do you know what to do next? ?